Pregnancy can bring so many new discomforts. The early days are often spent exhausted and nauseous, though some women report feeling their healthiest at this time. Most women, however, feel some sort of discomfort while carrying a child, particularly at the time when their belly begins to expand and they find themselves not able to comfortably sit or lay down as they could before. During pregnancy, a woman can gain anywhere from a few pounds to over a hundred. This extra weight puts pressure on the spine, causing lower back pain for pregnant women. In addition to this, pregnant women often suffer from unexplained sciatica, heartburn, indigestion, general discomfort, and the dreaded ‘rib kick’. Often pregnant women find themselves sleepless at night, not only due to the discomfort associated with their changing body but also because of the anxiousness of expecting a child. The tossing and turning that accompanies these disturbed sleep patterns often result in less sleep for other members of the family, and tired mornings can cause unexpected arguments, with pregnancy hormones flying. Even the smallest bellies can cause an uncomfortable, bloated feeling, in addition to possible problems with sciatica and back pain. Many women spend their time while pregnant searching for solutions that will help to make their pregnancy more comfortable. Heat packs and topical creams may help, and some women find comfort in professional massage, however, these solutions do nothing to prevent tossing and turning at night. This is not only disturbing for pregnant women but their partners as well, if they are easily disturbed by their partner’s movement in bed. Pillows have been used to enhance comfort since the times of ancient Mesopotamia, around 7000 BCE. The first pillows were hard, and often fabricated from stone. The first pillows were meant to keep the head elevated while sleeping, avoiding bugs crawling onto the face. Some hold the belief that it was the Egyptians who took this design and changed it to suit their royal and lush way of life. The Egyptians softer pillows were not commonly used, and considered to be a luxury. Since the Industrial Revolution, pillows have become a commonly found item in North American bedrooms. They adorn beds and couches. Some are used for comfort, some strictly for decoration. Pillows used in pregnancy usually serve two purposes – comfort for sleeping pregnant women, and also support for women when feeding their child after birth. A pregnancy pillow or maternity pillow may not be considered a necessity, however, current designs are making purchasing a maternity pillow a more popular choice among women. Depending on the discomfort, the pillow can be used between the legs or under the belly, while sitting or lying down. Pregnancy or maternity pillows differ from traditional body pillows because they are designed to cradle a woman’s unique shape in pregnancy. Some women try to use regular pillows to enhance their sleep comfort at night, however, many women find that the pillows move around, causing the pregnant woman to awake in the night to reposition the pillows. Regular pillows also do not curve to the shape of a woman, conforming to her body for ultimate comfort, as a maternity pillow will. Many women try to alleviate their discomfort in other ways in the early stages of pregnancy, but most find that a maternity or pregnancy pillow is a necessity. Of course, there are women who continue to childbirth without using a maternity pillow, but other women feel they are an absolutely necessary part of pregnancy. Investing in a pregnancy pillow is a decision that few women regret after giving birth. In first pregnancies, particularly, those last undisturbed nights are held at a high value, and pregnant women should get the most out of these nights as they can. Pregnancy and maternity pillows currently are available in many different shapes, sizes, and designs. There is also a variety of choices in material and filling, making each woman’s individual purchase worth it to their comfort. Maternity pillows can be expensive and should be considered an investment. Experts recommend that pregnant women read product guides about the many different options they have, and choose a pillow that will not only serve their needs in pregnancy but after childbirth as well. This comprehensive guide will cover all the basic knowledge to do with maternity pillows available today, as well as a variety of popular choices available for purchase today. The best source for information lies online. Here, pregnant women can find almost endless information along with real customer reviews that they can use to form their decision. affordable price. The bamboo, hypoallergenic cover appeals to women with allergies or sensitive skin, and the traditional angle can support both the belly and the back. It is filled with orthopedic foam, that claims to be the perfect mix of soft and firm while providing a cooling comfort to its user. Additionally, its simple design allows this pillow to be used in many different positions, allowing for proper alignment in the spine, and a comfortable side sleeping position. The small size does not intrude on living space, either. Real customer reviews claim that this pillow is “perfect”, and for a great price. They also attest to the company’s claim of a perfectly soft yet firm pillow. Customers love that the case is removable, and easily cleaned. Overall this wedge style pillow comes highly recommended by those who have purchased it in the past. award winning. It was designed by a mom and chiropractor and is used to alleviate pain in pregnancy, much like other maternity pillows. Made in the U.S.A., this pillow is unlike others in that it is certified to be fabricated without the use of PBDE flame retardants, mercury, lead, CFC’s, phthalates, and other heavy metals. The slipcover is removable and machine washable and comes in a variety of colors and designs. This pillow is great for travel as it features a carry handle on top, and also features pockets on the sides. This pillow was the winner of a Mom’s Choice Award, two Top Choice of the Year awards, and a Family Choice Award. Real customers claim that this pillow is worth “every penny spent”, although it is more affordable than other ergonomic back supports. while providing a restful sleep. Some users love this pillow, because it provides the comfort of a ‘U’ shaped pillow, but is not as bulky as one side is shorter than the other. The shorter side also detaches to be used separately, leaving the larger part in an ‘L’ shape. This pillow is filled with hypoallergenic Fusion Fiber made from high heat polymers. This allows for easier breathing for users with asthma or allergies. It has also been suggested that this type of filling serves to prevent heartburn and indigestion, as well. Real customers claim this pillow to be an excellent choice not only for pregnant women but anyone who wants extra comfort or support. Customers love the “endless positions” that this maternity pillow allows, and say that their sleep habits and body pains are greatly improved by use of this pillow. They also love the removable and durable cover. pillow on Amazon”. This ‘C’ shaped pillow supports in between the legs, under the belly at the bottom, and the head at the top, while the long part of the ‘C’ shape supports the backside. The cover is removable, and machine washable. Additionally, this design was developed and patented by a woman who is both a mother and a Registered Nurse. According to the manufacturer, this pillow is unique in its design, following the body’s natural contour and shape during pregnancy. Real customer reviews state that while some people do not appreciate the pillow’s large size and weight, pregnant women love the full body support that this pillow provides, and one review suggested that the entire pillow is machine washable. This is an added bonus for women thinking of keeping the pillow for some years after childbirth. Although this is one of the more expensive models, it is not overly expensive for a pillow of this size and quality. Many real customers remain happy with their purchase, regardless of price, and would recommend this product to other pregnant women. LeachCo also makes a ‘U’ Shaped pillow for women who require a different kind of support. This type of pillow allows for equal support of the back and belly at the same time, and no need to re-position the pillow when switching from side to side at night. This pillow has an hourglass shape that supports the body well and allows the hips and joints to stay in proper position. This pillow is ideal for many types of health problems including acid reflux, fibromyalgia, and carpal tunnel syndrome. The manufacturer boasts that this pillow allows for a comfortable sleep no matter which sleep position is preferred, and real customers rave about not having to re-position the pillow at all during the night. shape, allowing for a multitude of positions with only one purchase. The extension attaches securely with a zipper when in use, or can be detached for use as a wedge or footrest, or forextra height. This pillow also conforms to the curves of a pregnant woman’s body and also has a removable and machine washable cover. The ‘U’ shape also allows for women to re-position themselves in the night without having to lift or move the pillow, as well. Moonlight Slumber’s Serenity Star Pillow is an oversized ‘U’ shaped pillow that spans the width of a twin sized bed. The pillow detaches on both sides, creating two long body pillows, and a curved head pillow. 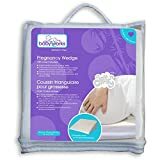 This allows for many comfortable combinations for pregnant women who find that traditional maternity pillows don’t target the specific areas that they need. Made in the U.S.A., the pillows can be stacked as needed for added height, and any of the parts can be used separately for isolated support between the knees, under the belly or head, or behind the back, allowing for ideal alignment. This particular pillow is a good buy for those wanting to use it throughout their child-rearing years, as the individual parts can be used in so many different ways. The Serenity Star pillow is filled with an extended polymer called Fusion Foss, that is known to allow air to flow, and this pillow is guaranteed by the manufacturer never to flatten or become lumpy. This pillow is also hypoallergenic, free of odor, and the filling resists dust mites. uses – it not only serves as a super plush support for back or belly but also a baby bed for after childbirth. Lightweight, and machine washable, this pillow is great for travel, and its functionality makes this pillow a great investment for years after childbirth. It also has a super soft blanket, sold separately, that fits perfectly to its shape. Independent designer Kathe Kruse manufactures naturally filled rye and spelled pillows, that make great gifts for pregnant women. For women expecting baby girls, the pillow can double as decoration for her daughter’s bed after childbirth. No longer do women need to choose from only a few options when buying a pregnancy pillow. There are many different pillows that women can currently choose from. The style, shape, and size are important factors for women to consider before purchasing a maternity pillow, and thought should be put into what the pillow will be used for and the pregnant woman’s preferred sleep position. Wedge pillows are smaller in size, and are often firm. They resemble the shape of an orange wedge and are used to slide underneath the belly or back or prop up the legs, for comfort. Wedge pillows are among the most affordable options for women looking to purchase a maternity pillow, and they can be used during pregnancy as well for breastfeeding or other members of the household, so many women feel good in their investment when choosing to buy a wedge. When the wedge is used to support the pregnant belly, the weight is held up and off of the woman’s back and hips, preventing possibly permanent problems in posture and health. Often, women prop the wedge pillow behind their back in hopes of staying on their side for the entire night. Wedge pillows can also be used underneath a regular pillow, to prop up the head, relieving some heartburn and indigestion. A heat pack also fits snugly against the wedge pillows flat side, keeping it in place against the woman’s back or belly. Wedge pillows are appealing to consumers because they can be smaller and inexpensive. The covers are often removable and machine washable, and they can be easily changed to suit preferences in decor. Pregnancy wedge pillows are especially handy when traveling, as well. One disadvantage that some women find in purchasing a wedge pillow is that the side slope is not comfortable for them. Some women prefer a steeply sloped pillow, while others require the slope to be more level. Different companies make their pillows with varying slopes, and it is unfortunate that it is only after purchase that pregnant women find that they do not help. Regardless of the slope, however, an inexpensive wedge pillow can be used as a foot prop or feeding pillow. Maternity full body pillows run the length of the pregnant woman’s entire body and are often curved in shape. Pregnancy full body pillows allow pregnant women to prop the cushion between their knees, under their bellies, and under their heads, at one time. This style of pillow is ideal for side sleepers, but mention has been made as to the fact the full body pillow does not support the back. Regardless, owners of this type of pillow love the support that the pillow provides while stationary. This allows the pregnant woman to sleep undisturbed by having to re-position pillows in the night. Two styles of pregnancy full body pillows are currently available. Straight Maternity Body Pillows are similar to traditional pillows in that they can be fluffed, but not bent or twisted in any way. They are often the less expensive design of the two and can provide alleviating comfort, but some women really love to be able to bend and adjust their pillow as needed. Flexible Maternity Body Pillows can be filled with Styrofoam beads, however, some more expensive options are filled with conforming micro beads that allow the pillow to be twisted and bent to suit the current needs of the pregnant woman. Pillows that are filled with micro beads also hold their shape longer, with some customers reporting their pillow lasting for years as if it was brand new. Owning a full body pregnancy pillow allows for support of the entire body, including the head, and making additional pillows unnecessary. Back sleepers looking to buy this type of pillow should consider their needs and what type of pillow would best suit them. Women with smaller beds should also consider the fact that full-length pillows do take up a good amount of room, however, this may be a small price to pay for a restful sleep. Maternity total body pillows wrap around the entire body, front and back, for total support if needed. Total body pillows allow for all the comfort and stability of a body pillow but provide some much needed back support for some. Women especially who suffer from back pain or pregnancy sciatica will benefit from this type of pillow. Total body pillows are available in both Styrofoam filled and micro bead filled designs, allowing for some pillows to be twisted and bent by its user as needed. There are currently two styles available in maternity total body pillows. A C-shaped pillow is designed for one end to be placed for support in between the legs, and the other underneath the head. The curve of the ‘C’ shape supports the back, however, there is no belly support, which should be taken into consideration. A U-shaped pillow supports the back on one side, and between the legs at the lower curve of the ‘U’. The other side of the pillow runs the frontal length of the body, supporting the belly, with the end of the ‘U’ underneath the head. This style of maternity pillow is found to be especially comfortable for women who used to sleep on their backs, but no longer can due to their growing belly. The disadvantage can be the often higher price, as well as the large size of the pillow, which some find to be hassling. When deciding which pregnancy pillow to buy, there are so many aspects to consider today. Women should consider which features are important to them, and how much they are willing to pay for these features. Often, it helps to let some things go, as a pillow that has everything often requires that customers pay for it. Once a decision is made as to the style or design of pillow that is best suited, customers should look at two factors – the cover, and the filling. Can replacement covers be purchased? Does it have a zipper or buttons, and if so, will these become aggravating? What is the most comfortable versus the most affordable? Is there a concern for the environment, or the use of natural materials? Styrofoam balls similar to the ones found inside of bean bag chairs are often used. These are found in less expensive pillows, making this type of filling the most affordable option. Styrofoam allows for the cushion to accommodate the body’s shape easily, however, this type of filling is not exactly environmentally friendly and can make some noise as well. After time, Styrofoam beads also lose their shaping, casing the pillow to fall flat. Polyester filling is sometimes used in maternity pillows, and real customers love that there is no noise compared to Styrofoam. Customers also get to choose between soft and firm pillows with this type of filling. Tiny microbeads are sometimes used as well, and real customers love the feeling of this pillow being filled with sand. These pillows weigh very little, make no noise, and can often be bent or twisted to suit the user’s comfort. Memory foam is a common request among pregnant women, as it conforms to the body and holds its supportive shape for hours. Women who prefer a softer pillow should stay away from this type of filling. Women who aim for a natural pregnancy often seek out a maternity pillow that is filled with spelt, wool, or kapok. Spelt is the preferred choice for vegetarians. Another factor to consider when choosing a maternity pillow includes whether or not the pillow is hypoallergenic. A hypoallergenic maternity pillow may not be necessary for pregnant women who do not have asthma, allergies, or sensitive skin, however, all baby’s skin is sensitive. A hypoallergenic pillow may be an optimal choice if the pillow is intended for use in feeding the baby after birth. Additionally, what size of a pillow is really required, and is there space in the home or bed for a larger sized pillow? This comes down to personal needs, and what each pregnant woman individually feels will provide the most comfort. Women should also take the time to consider how soft or firm of a pillow they prefer. Lastly, anyone looking to purchase a maternity pillow should think about the aches and pains that the pregnant woman is currently experiencing. Some women have extensive problems with their upper or lower back, while others find that they need the most support under their belly or in between their legs for hip support. Often, it is a problem of swollen ankles that could be simply elevated with an inexpensive maternity wedge pillow, however, some women have serious pains related to their pregnancies, and need to invest more to alleviate their symptoms. Women who have carried twins can attest to the extreme discomfort that they felt due to their size. Many moms who have carried twins recommend a ‘U’ shaped body pillow, and believe that the investment in a larger size pillow was worth it. Plus sized women often report that they love ‘C’ shaped body pillows, and claim that this style of pillow allows for many choices in positioning the pillow around the body. Many petite women prefer a smaller pillow, and some have reported that they find larger pillows to be heavy and hard to maneuver around their bodies. Side sleepers often find the most comfort at night, as this is the recommended sleeping position for pregnant women by experts. Side sleepers have the luxury of finding comfort in most any maternity pillow that they choose to purchase. Back and stomach sleepers encounter more challenges as their pregnancies progress and their bellies grow. Back sleepers often look for a maternity pillow that pushes against their back, giving them the feeling that they are lying in their preferred position. Stomach sleepers can be the most uncomfortable while pregnant, unable to find comfort in their preferred position after the belly begins to expand. Some stomach sleeping pregnant women prefer to keep their maternity cushion on top of their body, with their belly cradled between the cushion and the bed. Anyone who makes a choice to improve their comfort during pregnancy deserves a pat on the back. Often, pregnant women get into the habit of putting their children first, even before they are born. Good mothers know, however, that they are the best mothers when they are well rested, and take care of themselves. For those who know that they want to purchase a pregnancy or maternity pillow, and don’t know where to start, it is wise to first think about individual needs. Some women only want a little bit of support for their growing belly or do not have much living or bed space, so they choose to buy a wedge pillow. Others require the support of a bigger maternity pillow (Recommended reading:Best Maternity Clothing) for their own health and comfort. There is also color and design to think about, but some women place greater emphasis on purchasing a pillow that is hypoallergenic or has a natural filling. A removable and machine washable cover that is soft and comfortable is an important feature for some women, while others don’t plan to invest much money and don’t look for this feature. Regardless of preferred style, there are a number of great options available for pregnant women, or anyone who requires extra support while they sleep. Real customer reviews often provide the best insight into actual experiences as to a product’s quality or durability, and future customers can use these experiences to avoid purchasing any product that may not be worth the investment. Previous articleSpotting or Bleeding During Pregnancy: Is It Normal?